Dove Chocolate Bars gets a new look and four new flavors starting January 2019. - Bourbon Vanilla Dark Chocolate - Bourbon vanilla swirled throughout smooth dark chocolate. - Salted Caramel Blonde Chocolate - A blend of white and milk chocolate with sweet caramel notes and a hint of sea salt. - Raspberry Rosé Dark Chocolate - A sweet pink layer with raspberry and rosé flavors over dark chocolate. - Almond Brittle Milk Chocolate - Buttery toffee and almond pieces in milk chocolate. 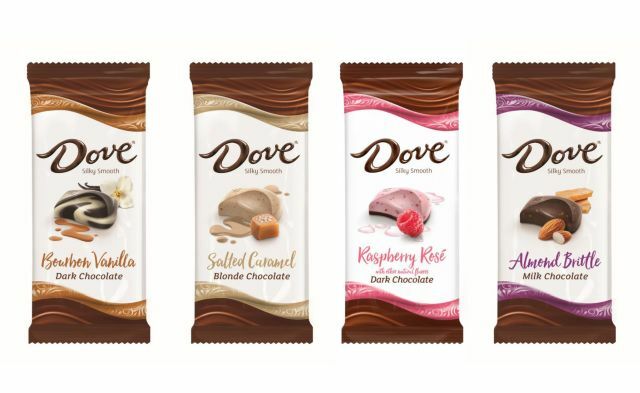 You can find the new Dove Chocolate Bar flavors in the candy aisle nationwide starting next month. The suggested price is $1.99 for a 3.3-oz bar.